By: Heather Maxwell. This blog was originally published by Voice of America. Music had a big role to play both during and in the aftermath of the West Africa Ebola epidemic. I found that out when I visited Monrovia in August. A lot of artists wrote songs about the personal experiences people had facing the disease. Henry Amazin’ Toe, a.k.a Amaze, is a well-established hipco artist who composed and recorded such songs.I met Amaze several times during my stay in the Liberian capital. The first time was during a group interview I held in Mamba Point with other artists (Teddy Ride and Margaret Cephus). Then again at our VOA Town Hall at the YMCA. Amaze performed with his female MC counterpart Peaches and answered questions about music and Ebola after his set. I also saw him perform live at the number one hipco music joint in Monrovia, ‘146‘. The club is owned and run by hipco pioneer and revered music legend, Takun J. Amaze, who’s is 29 years old, made two important points about music and Ebola during our conversations . First, he said that music impacted Ebola immensely. “Music is what people listened to. Its what made people wash their hands with chlorine. It was what made people start being hygienic…especially hipco.” And those last two words, “especially hipco,” was Amaze’s second important point. In my earlier post about hipco star Teddy Ride, I’d discovered that for some musicians, like Teddy, Ebola helped them become famous. 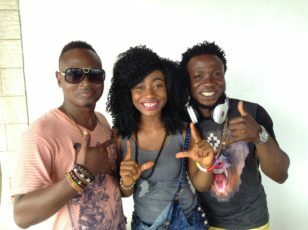 It boosted the music industry in Liberia. But my encounters with Amaze in Monrovia made it very clear that music made a difference for a lot of terrified, grief and panic-stricken Liberians. Just before I met him outside of the Town Hall on Broad Street, I had a chat with another musician about the impact of music and musicians during the Ebola epidemic in 2014-16. Ebeneezer is the keyboard player and leader of the band who backed up Amaze, Peaches, Teddy Ride and the other featured artists. Liberia was declared free of active Ebola transmission on January 14 2016. Heather Maxwell produces and hosts the award winning radio program “Music Time in Africa” and is the African Music Editor for the Voice of America. Heather is an ethnomusicologist with a Ph.D. from Indiana University specializing in African Music. She is also an accomplished jazz and Afrojazz/Afrosoul vocalist and has been working, researching, and performing in Africa and the U.S. since 1987.